Help China Name Its Carrier! Jim Holmes asks for your help to name China’s newest weapon of war. Shipwrights in Chinese yards worked wonders transforming a Soviet hulk sold for scrap into a working aircraft carrier. The flattop formerly known as Varyag has ventured out of port on sea trials several times this past year. The People’s Liberation Army Navy appears satisfied with its performance. In fact, some press outlets speculate it could be placed in commission asearlyasthismonth. But it needs a name. It must stop being the Prince of the naval-aviation world. Our friends in Beijing are evidently having a hard time settling on a name, though. ThevesselwasreportedlygoingtobearthenameShiLang, for a long-ago conqueror of Taiwan. When word got out, the ensuing uproar apparently convinced China’s leaders they were being a tad heavy-handed—especially when they were cultivating an era of good feelings across the Taiwan Strait. Since then the poor ship has gone by “ex-Varyag,” truly an undignified moniker to grace China’s first operational carrier. And China will thank you. 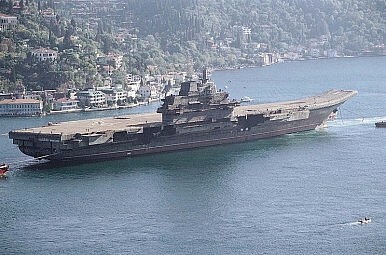 China has recently commissioned its first aircraft carrier. How does it stack up against its competition?